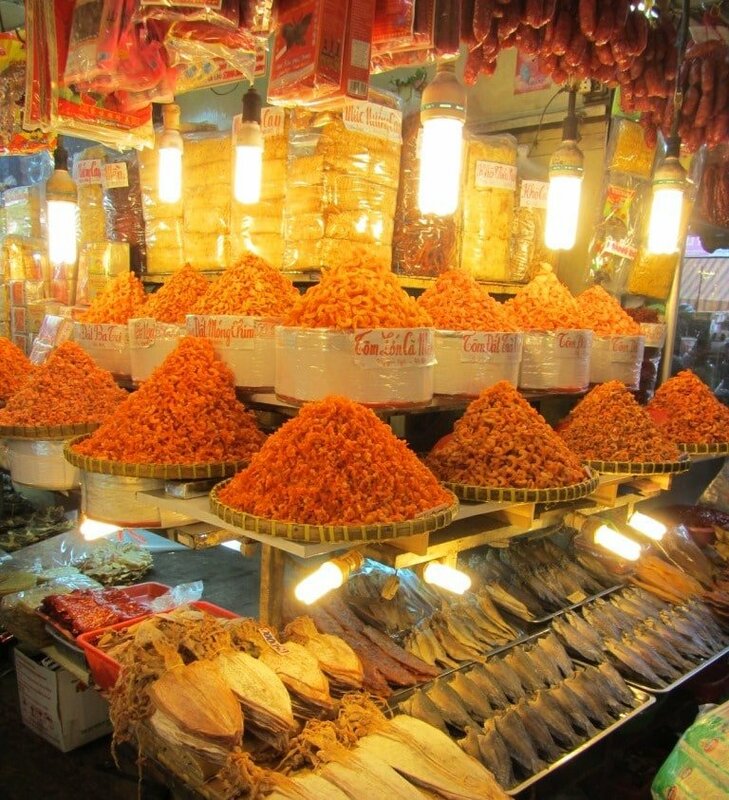 Saigon’s markets seem to exist in another dimension to the rest of the city. In downtown District 1 you’d be forgiven for thinking that the traditional Vietnamese wet market no longer exists; replaced by generic high-end shopping malls. 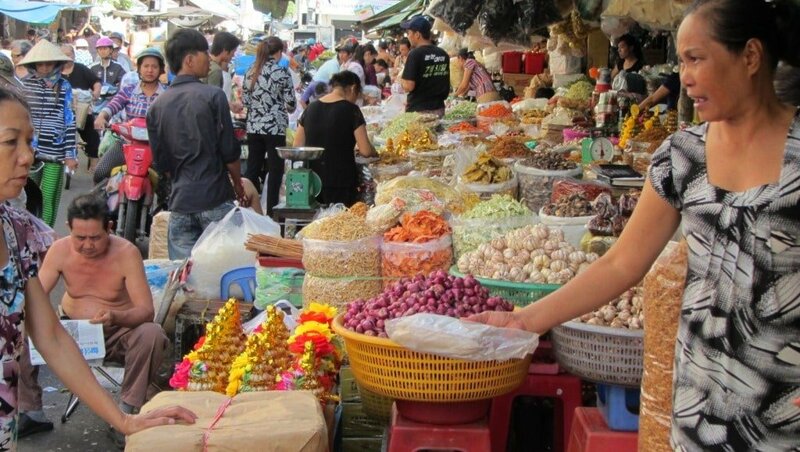 But, with the exception of Bến Thành Market (which caters largely to foreign tourists these days), local markets outside the city centre continue to thrive. Still as bustling, vibrant and fascinating as ever, these markets play a major role in most ‘ordinary’ people’s daily lives. Saigon’s markets are highly organized, the produce is local and fresh, and the sheer volume and variety of things for sale is remarkable. Once you’re in the embrace of one of Saigon’s markets you leave the modern façade of District 1 far behind, and enter a more colourful, friendly, and personal world. Below are my top 5 markets in Saigon. 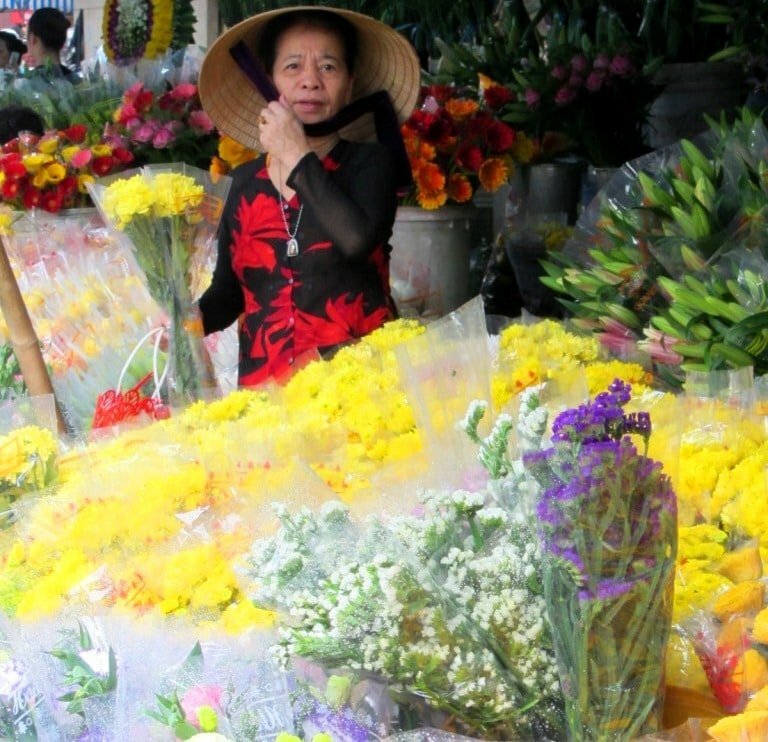 To best appreciate Saigon’s markets, visit during the mornings; the earlier the better. 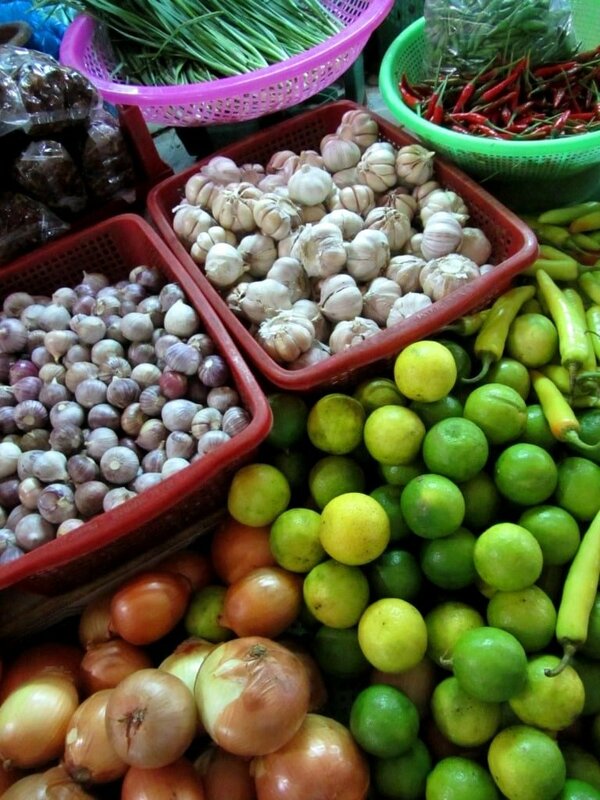 At this time of day, the produce is at its freshest and most colourful, and the markets are at their busiest. Nothing can beat the morning rush and the glory of fresh produce at the beginning of a new day. From 10am, the best has been bought and the customers long gone: herbs start to wilt in the heat, fish start to die in their shallow water and fruit loses its shine. These markets represent a much poorer side of Saigon, yet here you’ll find some of the friendliest, liveliest, most convivial people in the city. Come with a sense of adventure, and expect products (and aromas) both wonderful and weird. The following markets are in no particular order of preference: they’re all fantastic. Like so many of Saigon’s markets, from the outside Xóm Chiếu is an eyesore: a horrible concrete egg carton of a building; grey, grim and bleak. But such is the buzz of people and produce around the perimeter of the market square, you quickly forget about the shortcomings of its façade. All along the outer edge of the market square there are food stalls selling delicious street food dishes, and opposite them, under the concrete slabs of the market exterior, are fruit and vegetable stalls, all bursting with colour in the early sunlight. Through the narrow market entrance there’s a tight outer circle of stalls specializing is all sorts of dried goods, kitchen equipment and bottled sauces. At the heart of the market, in a cathedralic space filled with shafts of sunlight, the meat and fish take centre stage. Behind the stalls there’s a cooked food corner where customers – many of whom are market workers – dine on various Vietnamese delicacies from noodle soups to sweet bean desserts. You can’t help but notice that it’s mostly women over the age of 30 who populate markets like this in Saigon. Both the buyers and the sellers are female. There’s a distinctly chatty atmosphere; lively but not frantic. Many of the market workers have worked in the same spot for years so they know each other well. There’s lots of gossip and laughter – especially at the sight of a người nước ngoại (a foreigner) – but no one hassles you to buy from them as they do in Bến Thành Market. You’re free to walk among the produce, soaking up the colours and smells in the cool air and hushed atmosphere: there’s something very church-like about it. 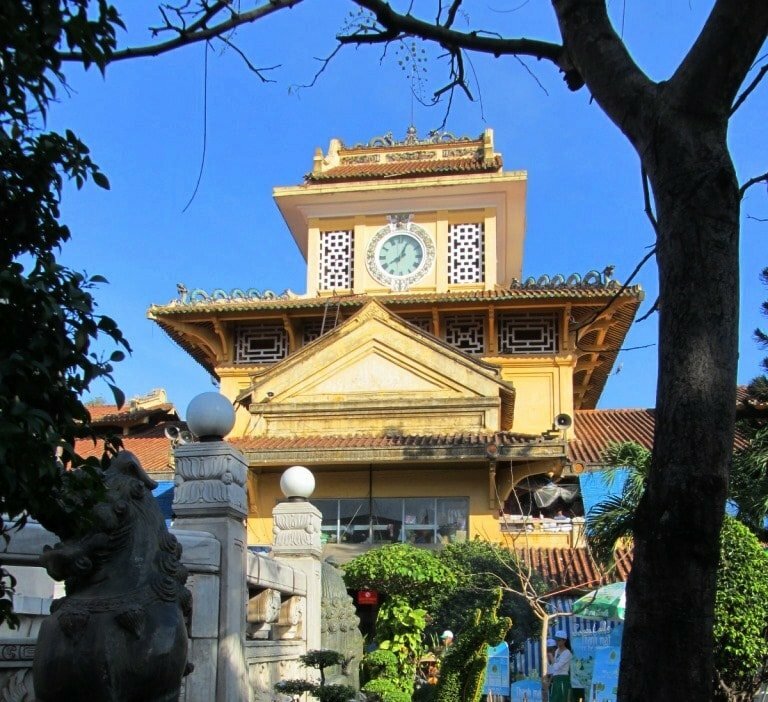 An exception to the rule when it comes to market facades, Bình Tây’s exterior is a beautiful and exotic mix of French architecture in the Chinese style: a big, yellow ochre, station-esque building with tiled roof, and colourful, floral, be-dragoned motifs on the porticoes and entrances. It’s an enourmous square structure built around a courtyard full of greenery with a shrine to the market’s founder, engulfed in incense smoke, at its centre. The section immediately after the entrance is dedicated to clothes, bags, fabrics, and scarves, which although colourful is rather boring compared to the food sections. Around the perimeter of the courtyard you’ll find all sorts of great-looking traditional Vietnamese and Chinese candied fruits and nuts in glittering packets, and not a Cadbury or Nestle logo in sight. There are big heavy-duty bags of other dry goods here, such as biscuits, grains, beans and spices. Follow the mouth-watering aromas all the way to the back of the market and this will lead you to a superb canteen where you could spend weeks ‘food-hopping’ from one stall to the next. The food coming out of this canteen is extraordinary, and this alone is reason enough to visit Bình Tây Market. There’s an incense and votive offering section beside the canteen where candles, paper money and printed prayers are bought to be burned as offerings to the ancestors. Right in front of this is a great butchers section with raw and roasted meats hanging on hooks, then there are herbs, pickled vegetables, dried mushrooms and medicinal leaves, until you hit the fruit and vegetable stalls that line the perimeter of the market building. Just like Xóm Chiếu there’s a strange hush inside this shady market – totally at odds with the rush and noise in the narrow streets surrounding it. Perhaps this is due to the sheer scale of these two markets: even the constant bustle of buying and selling can’t fill their massive spaces. Every great seafood-eating city has a great seafood market: Tokyo has Tsukiji Market, New York has Fulton Market, and Saigon has Bình Điền Market. Located on the outskirts of the city, Bình Điền is gigantic. Boats and trucks arrive in the small hours of morning to unload their produce, fresh from the rivers of the Mekong Delta, the East Sea, and the Gulf of Thailand. Before even the first glimmer of dawn, Bình Điền’s three enormous aircraft-sized hangers are filled with fish, shells, crustaceans, and reptiles, not to mention the meat, poultry, fruit and vegetables that also arrive on boats and trucks from the fertile southern provinces. 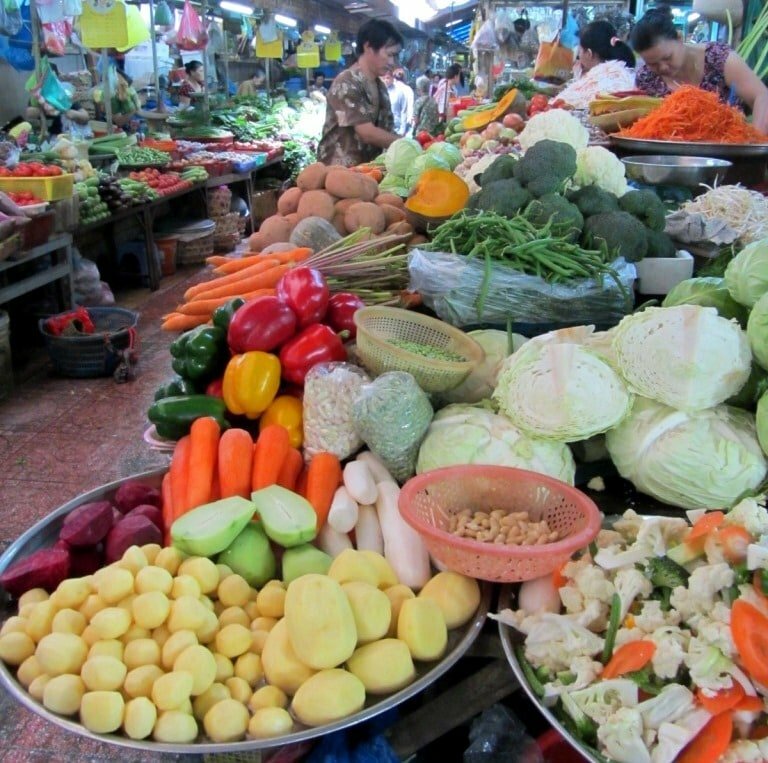 This market is where other markets buy their produce: Bình Điền is quite literally Saigon’s market of markets. For this reason you need to get here early: by 6.30am most of the produce has been bought, and workers are packing up ready for a well-earned, hearty breakfast. 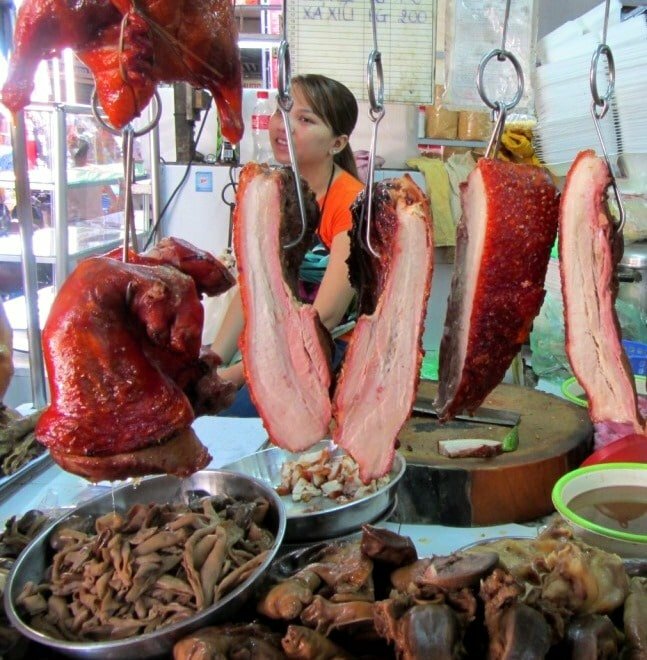 However, it’s well worth setting your alarm, because Bình Điền is like all Saigon’s markets rolled into one. There’s a palpable excitement amongst both the buyers and the sellers: everyone seems to know they’re partaking in something special, and on a grand scale. Produce is divided into separate hangers (each hanger big enough to fit multiple jumbo jets): there’s one for fish, one for shellfish and vegetables, and one for meat. The shellfish hanger echoes to the sound of shells being shoveled into boxes. 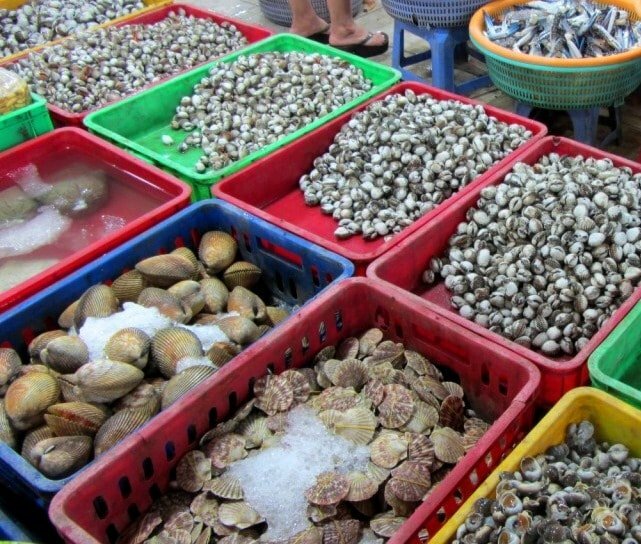 Most of the seafood – including shellfish – is alive; thrashing around in big metallic containers full of bubbling water. Despite the enormity of this market it’s extremely well-organized and efficient. Bình Điền is quite far from downtown Saigon, but these days, with all the city’s new infrastructure, the journey is reasonably short. There are more rice paddies and fish farms in the vicinity than buildings, but the District 1 skyline is still visible on the horizon. 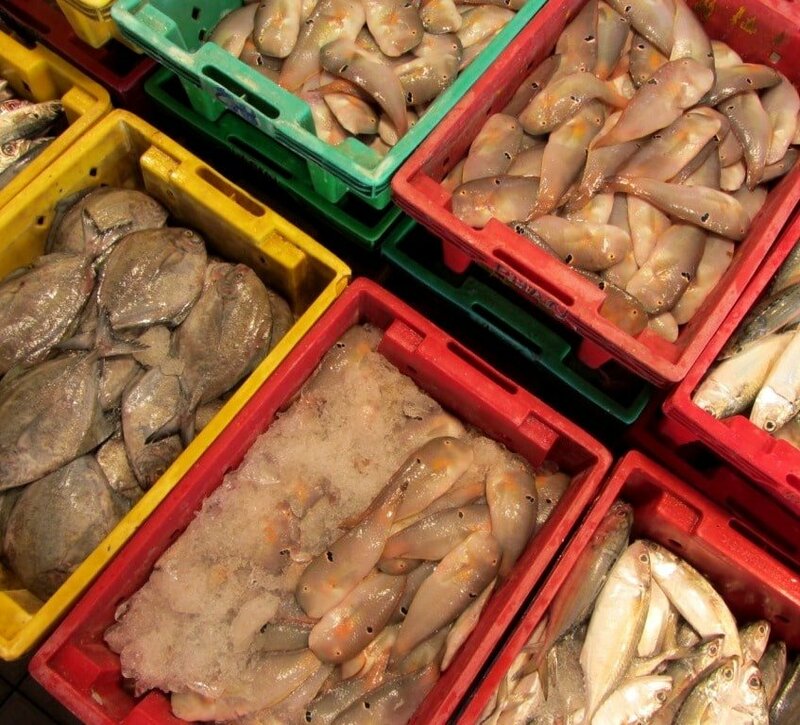 If you do come, do as the locals do and wear boots or substantial footwear: leave your flip-flops at home because it seems the fish brought most of their natural habitat with them to this market! Off the burgeoning Phan Đăng Lưu Street, Bà Chiểu Market is another Cold War-style nuclear bunker from the outside. But inside it’s equal to the busy road it fronts in intensity and pace. This is a big and busy market that has a rougher edge than the others in this list: more frantic, more local, more unruly, a little less friendly but just as jammed full of produce and energy. Absolutely everything seems to be on sale here. The market follows the familiar pattern of fruit and vegetables around the outside, dry goods along the narrow outer circle, and meat and fish at the centre. The stalls are tightly packed and labyrinthine, so much so that the atmosphere is almost ‘cosy’. There’s a first floor clothes market where you can find bags, scarves, belts and blankets too. Many of the items have price tags on them, but these should be used only as a guide for how much to bargain down to: from two-thirds to a half of the ‘official’ price tag is usually the ‘real’ price. Thus, a scarf with a 100,000VNĐ tag on it should be bargained down to 50-70,000VNĐ. Great value Vietnamese dishes are available at the market canteen along the western edge of the building. Yet another deeply unimpressive concrete exterior masks this compact and lively market. Hòa Hưng is on one of Saigon’s worst roads for traffic and noise, but once you enter its military façade all this is replaced by the sound of the market in full swing: the chopping of meat with shining cleavers on wooden chopping boards; the rustle of grains of rice being portioned out into bags; the slap of live fish being slammed on the counter to stun them; the yelling, laughter and banter between fish mongers and butchers. It’s on a smaller scale than the other markets in this list, which makes it much more manageable, but it still has all the energy and punch of a big market. Meat, fish, noodles, rice, spices, candies, sauces, fruit, vegetables, jewelry, and clothes are all sold in a relatively small space. It would be such a shame if, in the future, the sterile, soporific environment of the supermarket takes over from these local wet markets in Saigon.